An early piece by contemporary artist Louise Dear. Titled "Little Islands Too" signed and dated on reverse, June 2002. 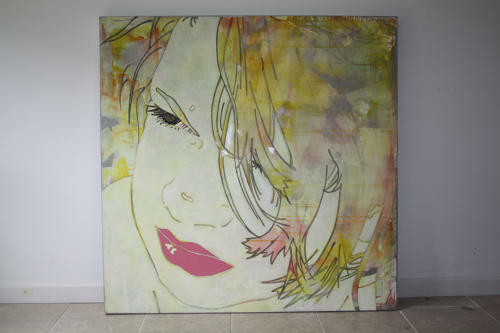 Louise works on large sheets of prefabricated aluminium, priming the surface then throwing, rubbing, pouring and dripping inks and dyes, glitter and glosses, to form a background - this is then sanded, scratched and distressed, depending on what image will be overlaid. Louise’s subjects exist on many levels, portraying innocence yet also the lack of it - the children are storybook beautiful, their unique spirit captured and immortalised in that perfect state.